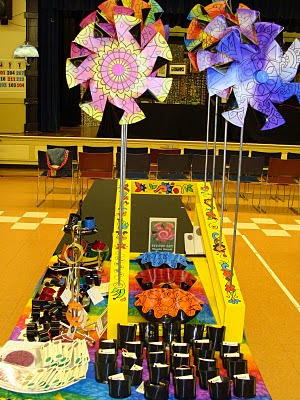 The 20th Annual Buckman Art Show and Sell opened last night and is going on today until 5:00 pm! 30% of sales support the school's arts programs! 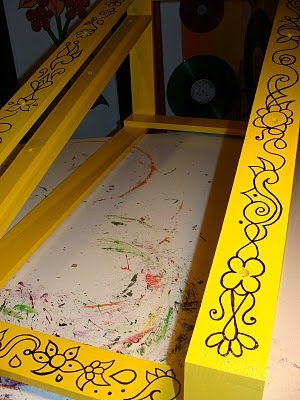 I painted it bright yellow with leftover paint from my kitchen, then drew the design with a black Sharpie Paint Pen. 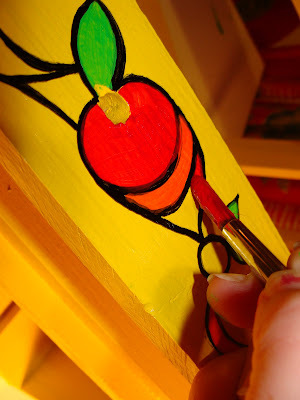 Then, I painted it in with acrylics and touched up the outline with more Sharpie after the paint dried. I think it turned out great! In other news! 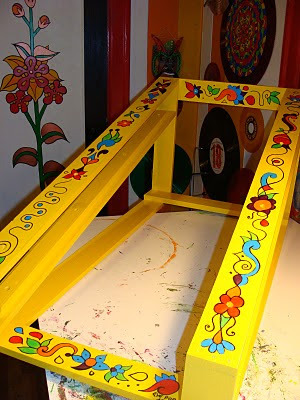 The order of 48 pinwheels for Uncommon Goods is just about done - all I have to do is paint the wooden knobs and wrangle some shipping pallets. I have volunteers lined up from Steps to Success to help with the packing and shipping, and we'll be using the facility at Trillium for that. 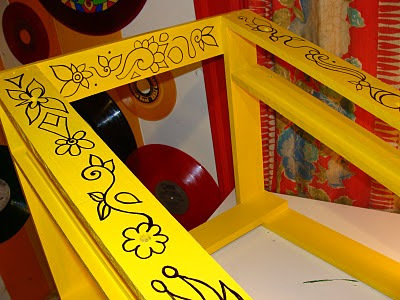 I'll have some pieces in the next Amazed event, a truly amazing installation (the theme is "Music") at the High Point Market, which is the world's largest home design show. 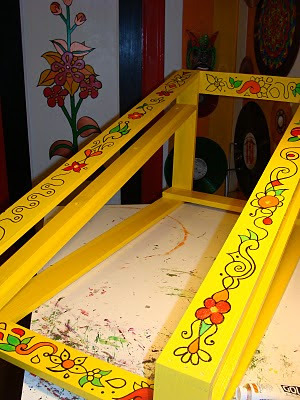 I'll be making a bunch of clocks and have plans to create a large room divider made from painted mandala records connected together. Some of my cuffs are now available from Canadian web retailer Modern Vintage Attic. You can read an interview with me on the site's blog here. 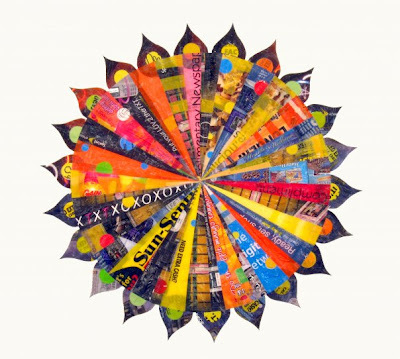 My clocks (carried by Buy Green) are currently being featured on the home page of the brand new eBay Green Shopping Hub. Here's a quick photo from our show last night at O'Malley's with Cootie Platoon and Muddy River Nightmare Band (You can see more photos here.) 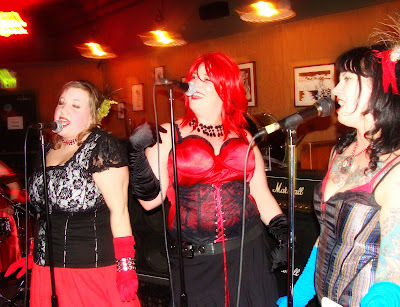 Check out our band Dartgun & the Vignettes on facebook and become a fan, why dontcha? Next gig is Chuck's annual Smash at the Ash, April 9 at the Ash Street. We'll be rocking with Junior's Gang, Hairspray Blues, and 48 Thrills. We have some fun surprises planned too. See you there, Portland! 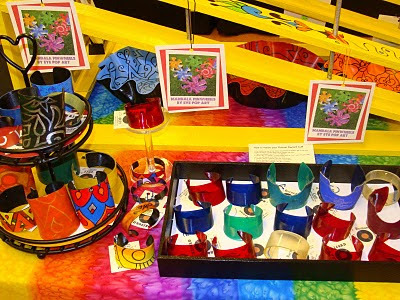 I'll be participating in my first craft show of 2010 tomorrow evening. 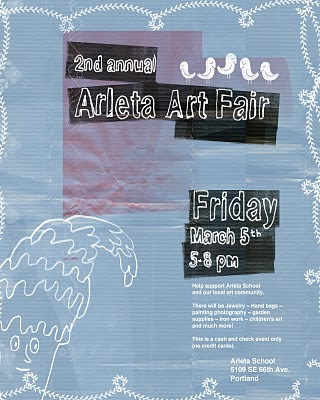 It's the 2nd Annual Arleta Art Fair at Arleta K-8 School. 20% of all sales will be donated to the school. I'll have lots of Roman Record Cuffs (including the new colored ones!) and window decals, as well as Mandala Pinwheels and Mandala Record Bowls. If you get there before 6:00, you will probably see the lovely Melodie standing behind my table. She's an Arleta mom who will be setting up and working for me during the first hour. Thanks Melle! In other news: I was interviewed yesterday for a feature article which will be published in the June issue of the Crafts Report! I've also been asked to provide photos of my bowls for possible inclusion in a Better Homes and Gardens special interest publication on decorating, which will come out this summer. 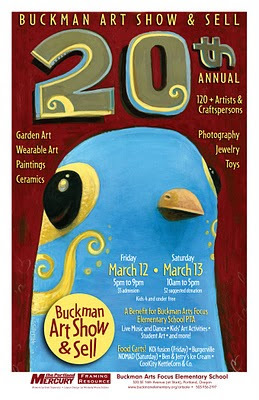 Next weekend (March 12 and 13) is the Buckman Art Show and Sell, another fundraiser for a great local school. I'll be there once again with all my groovy stuff. Hope to see you! 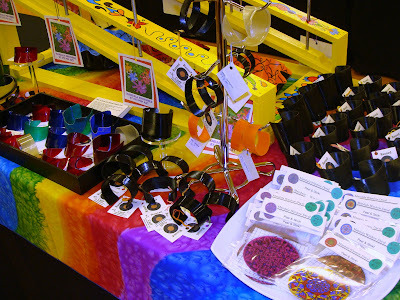 I'm also planning on doing the Lewis Green Garden Fair on April 17, and I've been accepted for Crafty Wonderland's Super Colossal Spring Sale, May 1 & 2 at the Oregon Convention Center. 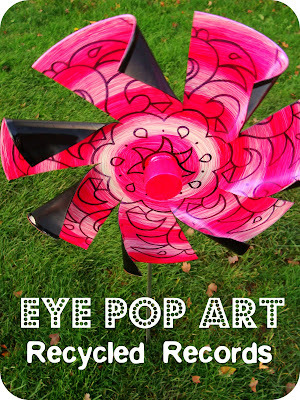 And of course I will be at the Recycled Arts Festival in June. 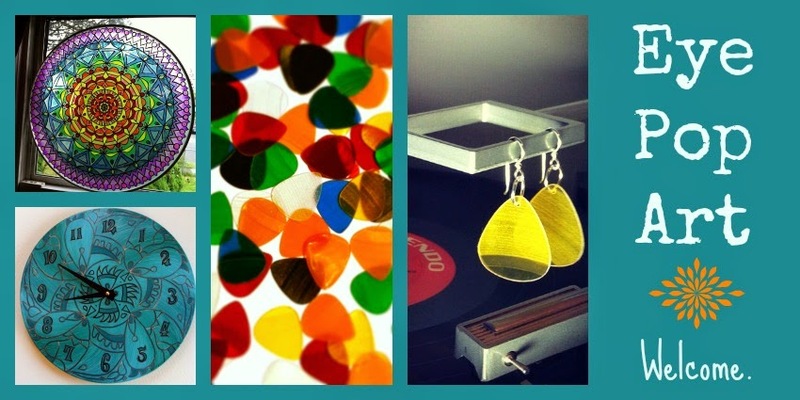 The craft show season is upon us, and I am starting to get excited for a fun spring and summer! 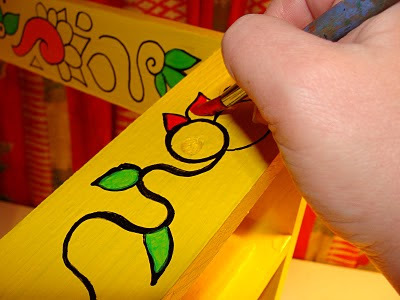 As promised in this post about the book 1000 Ideas for Creative Reuse, I plan to share some of my favorite creative reusers here on ye old blog. To kick it off, I have to start with my absolute favorite - Virginia Fleck. Oh my gosh. I am so amazed and blown away by Virginia's work. 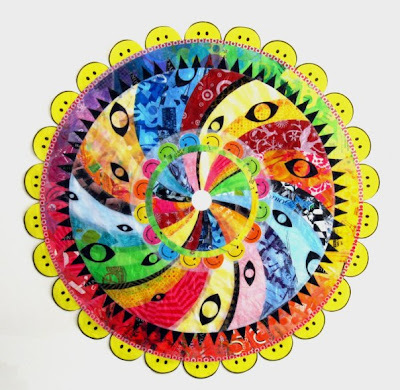 She creates stunning, gorgeous mandalas using plastic bags. 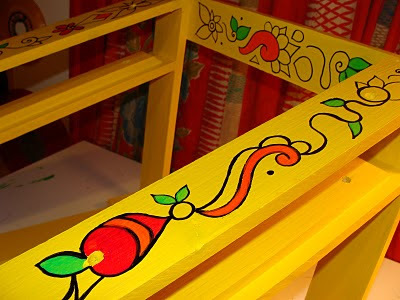 You have to look at her Public Art section to see some of the breathtaking installations she's created. Virginia also oversees a service organization called the Angsty Teenage Eco Warriors, whose mission is "to identify and evaluate critical environmental and humanitarian situations and to take action with engaging, effective volunteerism." I'm so inspired and delighted by Virginia's work and just had to share it with you. 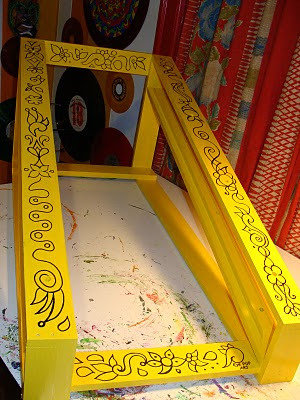 Please take a look at her website and enjoy the recycled beauty!